The 70s were a dynamic time in America. Interest in “Eastern” religions and philosophies was growing, with bits and pieces mixing into hippie culture. Terms and concepts previously known only among academics and small groups of “Western” practitioners became common. For example, the term Hare Krishna entered the dictionary in 1968, and yoga was on the rise. George Lucas and others responsible for Star Wars grew up and created the films during this period. Thus, conscious of it or not, some of these ideas made it into Star Wars’ own religio-philosophical system: the Force. 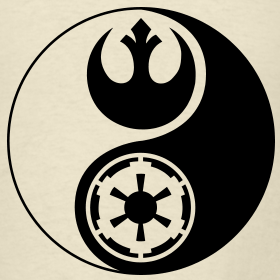 This post will focus on one influence for the Force, the Chinese concepts of Dao, yin, and yang. Two texts describing the Dao and its relation to yin and yang are the Laozi and Zhuangzi, named after their attributed sages. The Dao, literally “the Way,” is described by Laozi as, “Nameless, … the origin of Heaven and Earth. When Named, it gives birth to all things.” The Dao is not a personified deity, making it hard to describe. When teaching, I’ve used a quote form Obi-Wan Kenobi to help: “It’s an energy field created by all living things. It surrounds us and penetrates us; it binds the galaxy together.” Nothing exists outside of the Dao, in the same way that nothing in the Star Wars universe exists outside of the Force. The Dao, or the Force, is everywhere, in everything. In essence, it is reality. Laozi continues, “Under these two aspects, it is really the same…. In recognising beauty, we have the idea of ugliness; in knowing something as good, we consider other things as not good…. difficulty and ease complement one another; length and shortness fashion each other; height and lowness contrast….” This means that the Dao, what we might call ultimate reality, is one thing. However, it is perceived in terms of duality – light and dark, hot and cold. Yin and yang are equal and cannot exist without each other. The yin section is not 100% yin, but contains a small amount of yang, and vice versa. Together in balance, they form a whole. As Zhuangzi illustrated, imbalance results in disharmony. This can be present at a micro level, like an individual. For example, on a visit to China I developed a sore throat. A practitioner of traditional Chinese medicine asked what I had eaten recently, and determined that I had ingested too much food with yang energy and thrown off my balance. This also exists on a macro level. A house, a city, or even a nation (or galaxy!) can be imbalanced and experience bad luck, war, sickness, and natural disasters as a result. Star Wars fans can immediately see a connection, especially when looking at the symbol: it could easily stand for the light and dark sides of the Force. Indeed, we see a not-so-subtle reworking of the symbol in the Mortis Trilogy of The Clone Wars. On the other hand, we have Darth Vader. Just like Yoda is not entirely light, Vader is not entirely dark. Regardless of how many countless beings Vader has murdered, Luke is still capable of sensing the light within that ultimately surfaces at the end of Return of the Jedi. This presents a question for discussion: viewing the Force in this way, is it possible that even Emperor Palpatine is not entirely dark? Just as the Dao cannot be fully expressed without yin and yang in balance, the fullest expression of the Force cannot manifest without both light and dark. What would a truly balanced Force user look like, someone who did not dwell in the light of the Jedi or the dark of the Sith? I’m hoping we’ll find out in the second season of Rebels. Ahsoka Tano left the Jedi Order, but has not become a Sith either. Star Wars fans will now be able to see what this type of Force user is like, one wielding white lightsabers as a symbol of her neutrality.